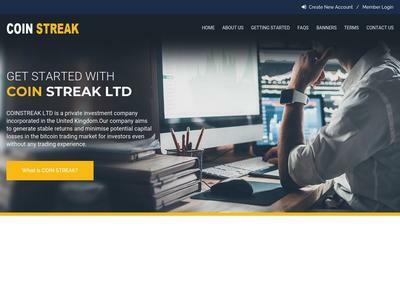 COINSTREAK LTD - an investment fund focused on maximizing profitability with minimum risk. Our site combines a pool of investors' assets are managed by professionals in the interests of investors. We use modern trading strategies, which include a variety of means of generating profit (currency trading, securities, exchange transactions, the crypto-currency industry). Our company provides a stable profit using effective tools and opportunities.We collaborate with popular brands and have privileged conditions (lower interest rates, insider information). The amount of 3 USD has been withdrawn from your account. Accounts: U4222871->U18696387. Memo: Shopping Cart Payment. Deposit to COINSTREAK LTD User nelomota.. Date: 17:09 20.07.18. Batch: 221683289. The amount of 0.21 USD has been deposited to your account. Accounts: U18696387->U4222871. Memo: API Payment. Withdraw to nelomota from COINSTREAK LTD.. Date: 10:51 21.07.18. Batch: 221744756. The amount of 2.52 USD has been deposited to your account. Accounts: U18696387->U4222871. Memo: API Payment. Withdraw to nelomota from COINSTREAK LTD.. Date: 09:23 21.07.18. Batch: 221738650. The amount of 0.42 USD has been deposited to your account. Accounts: U18696387->U4222871. Memo: API Payment. Withdraw to nelomota from COINSTREAK LTD.. Date: 21:31 20.07.18. Batch: 221702069. The amount of 0.21 USD has been deposited to your account. Accounts: U18696387->U4222871. Memo: API Payment. Withdraw to nelomota from COINSTREAK LTD.. Date: 20:07 20.07.18. Batch: 221696363. The amount of 0.21 USD has been deposited to your account. Accounts: U18696387->U4222871. Memo: API Payment. Withdraw to nelomota from COINSTREAK LTD.. Date: 12:57 21.07.18. Batch: 221752612. 21.07.18 15:49	Receive	Received Payment 1.05 USD from account U18696387 to account U14997830. Batch: 221765229. Memo: API Payment. Withdraw to HYIPObserver from COINSTREAK LTD.
21.07.18 12:19	Receive	Received Payment 1.05 USD from account U18696387 to account U14997830. Batch: 221750355. Memo: API Payment. Withdraw to HYIPObserver from COINSTREAK LTD.
21.07.18 09:24	Transfer	Sent Payment: 3.00 USD to account U18696387 from U14997830. Batch: 221738762. Memo: Shopping Cart Payment. Deposit to COINSTREAK LTD User HYIPObserver. Memo: API Payment. Withdraw to CFMonitor from COINSTREAK LTD..
21.07.18 21:07	Receive	Received Payment 1.05 USD from account U18696387 to account U14997830. Batch: 221784403. Memo: API Payment. Withdraw to HYIPObserver from COINSTREAK LTD.
22.07.18 02:13	Receive	Received Payment 2.8 USD from account U18696387 to account U14997830. Batch: 221794595. Memo: API Payment. Withdraw to HYIPObserver from COINSTREAK LTD.